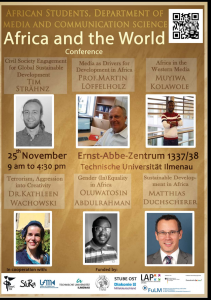 Conference “Africa and the World” – ISWI e.V. Are you interested in Africa and her relationship with the world? How Africa can achieve sustainable development and its implications for the world? How can we transform aggression into creativity to tackle terrorism? How is gender (in)equality in Africa and how does it affect the world? How can the civil society engage to stimulate global sustainable development? How does the western media portray Africa? – In these, what is the role of the media and how can the media drive sustainable development? The African students from the department of media and communication science, cordially invites you to attend a conference themed: ”Africa and the world”. 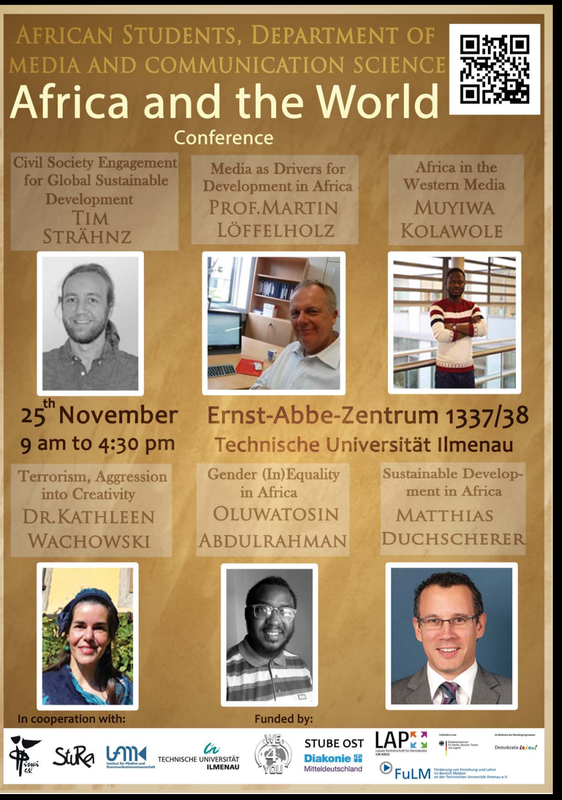 This conference is in collaboration with the ISWI, StuRa and supported by the institute of media and communication science,TU-Ilmenau. We want to hear your opinions, suggestions and questions. Come and learn, un-learn and re-learn your knowledge about Africa and the world! Presentations/speech and discussions are held in English by invited guests. However, fluency in English is not mandatory.There will be light refreshment and lunch (with a touch of African hospitality)and a chance to make new friends. So, we hope to see you next Saturday and to share an eventful day together. Do use the event options to indicate your participation and also feel free to invite your friends and colleagues.